Performances by the Army's last-surviving all-brass band have been cancelled to save money over the next few months. Appearances by the Regimental Band of The Royal Welsh until next April have been hit, including dates for Remembrance concerts and rugby matches. It comes as the Army looks to save £54m to plough into frontline services. "Afghanistan is our priority," said the Ministry of Defence, which hopes to re-start performances again next spring. The band's 30 members, most of whom are from south Wales, are all members of the Territorial Army (TA). All members of the regimental band have regular jobs or are students. 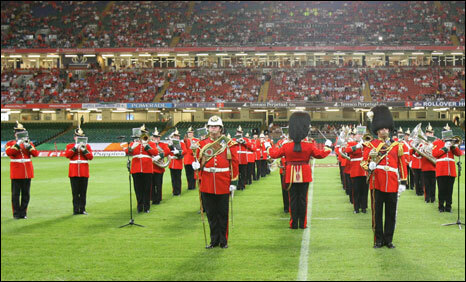 Famous for their bright red jackets, the band plays at many major sporting events and has performed the national anthem at every rugby game in the Millennium Stadium, as well as previously performing at Cardiff Arms Park. In addition to cancelled appearances at the autumn internationals and the Six Nations, the band will now not appear at scheduled annual Remembrance Sunday commemorations. These include the high-profile Wales Remembrance concert at St David's Hall in Cardiff on 31 October, where they were due to perform alongside Rolf Harris. The band will honour a charity appearance this weekend but members will not be paid for their time. A Ministry of Defence spokesman confirmed the move is part of a £54m savings strategy. "The money will obviously be directed to the front line. Afghanistan is our priority," he said. "These measures will be in place until next April, when things should start again. However, these are tough economic times. "But hopefully things will be fine next year."